Dances continued to be one of the favorite evening activities especially for the older girls. Camp Carolina was the boys camp most often invited to dances at Illahee, but Camp Tsali, and later, Camp Deerewood were also included. In 1962 even Hillbrook had a dance with Camp Carolina. Minerva Giles, one of the Hillbrook counselors for the summer, related the activities of the evening this way: “For the first few minutes, silence prevailed except for a giggle now and then from either the boy’s corner or the girls’ corner. Then, as they jumped into action with a lively square dance the ice was broken. When we walked in the door, some of the little boys were hiding under the tables. They looked as though their last moments of life had come.” Camp Carolina came to Illahee for afternoon tennis matches and this became a regular activitiy for the tennis players. At the traditional Big Sisters and Little Sisters party older girls and younger girls were paired as each other’s sisters for the summer. Robin, Teeter, and Marge held hill parties at Pinecrest during the summer to allow the girls a more informal way to get to know them. 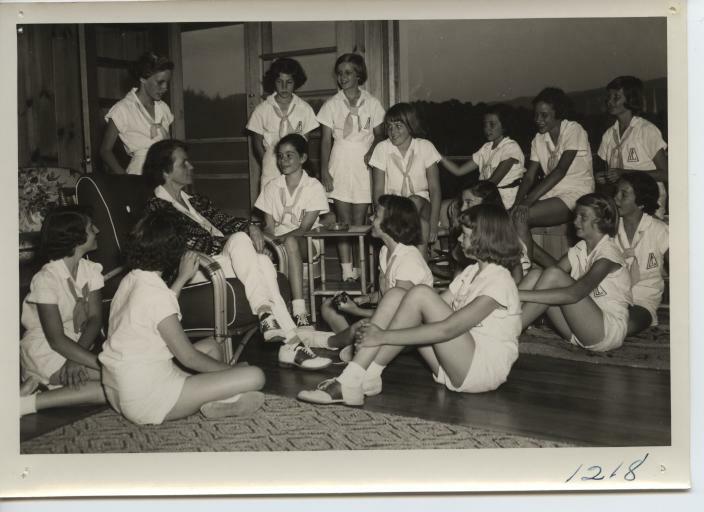 Lake Toxaway became the new outpost for girls on overnights and sailing again became a popular activity. The French Broad River canoe trips continued a tradition started during the first years of camp but now they were 20-mile excursions beginning in Rosman and ending near camp with a stop at “lunch rock” for rest and food. In 1960 Illahee had grown to include 260 campers, counselors and staff and as Robin reminded all of them if each one smiled at someone 20 times a day, the camp will be blessed with 5,200 smiles a day…The tradition of walking in pairs to the Woodland Chapel began in the early 60’s. Walking together in their Sunday Whites the girls would quietly approach the Woodland Chapel as a way to mark the difference between regular camp activities and worship. …In the spring of 1968 she had an interview for a position in the Physical Education Department at a college in Virginia. On the way home from the interview she stopped to visit Lo in Asheville and Lo suggested that they make a trip to Illahee to visit with Robin and Teeter. It was on this occasion that Robin presented Frankie and Lo with the same proposal she had made in the early 60’s – she wanted Frankie and Lo to follow her as Directors of Camp Illahee. Frankie mulled over in her mind the many connections to Illahee she had over the years, from her days as a young college-aged counselor to the later years as trips leader. 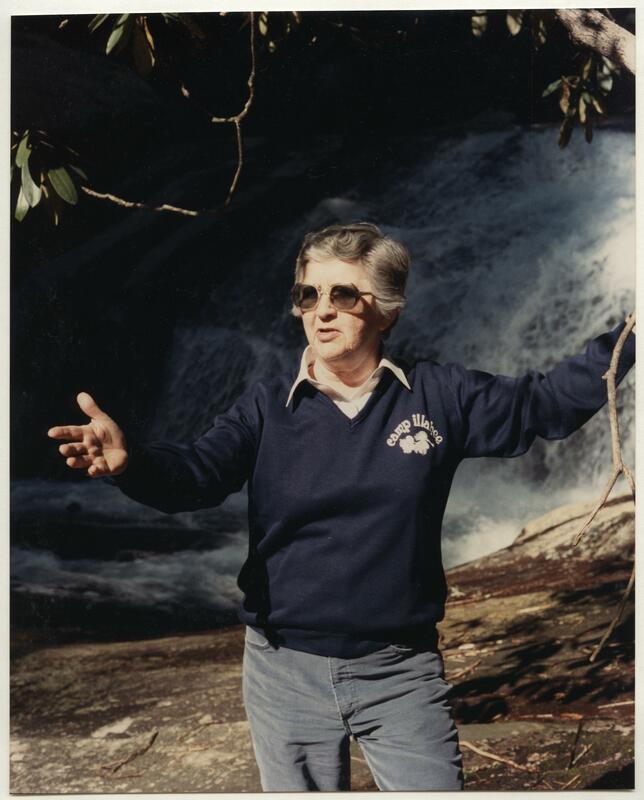 She remembered all the family connections that kept her involved with Illahee through Sis Vereen and Paige and the joy she found in camping, but especially prominent in her thoughts were the girls who had made Illahee such a great place. Illahee had never gotten out of Frankie’s blood and when the door opened this time she was ready.